Farming Foible, or an Agrarian Adventure? 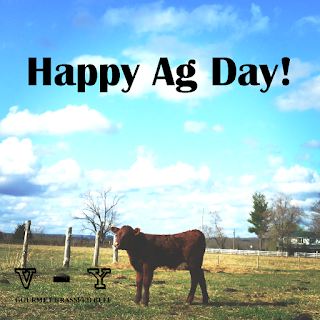 : Happy National Agriculture Day! 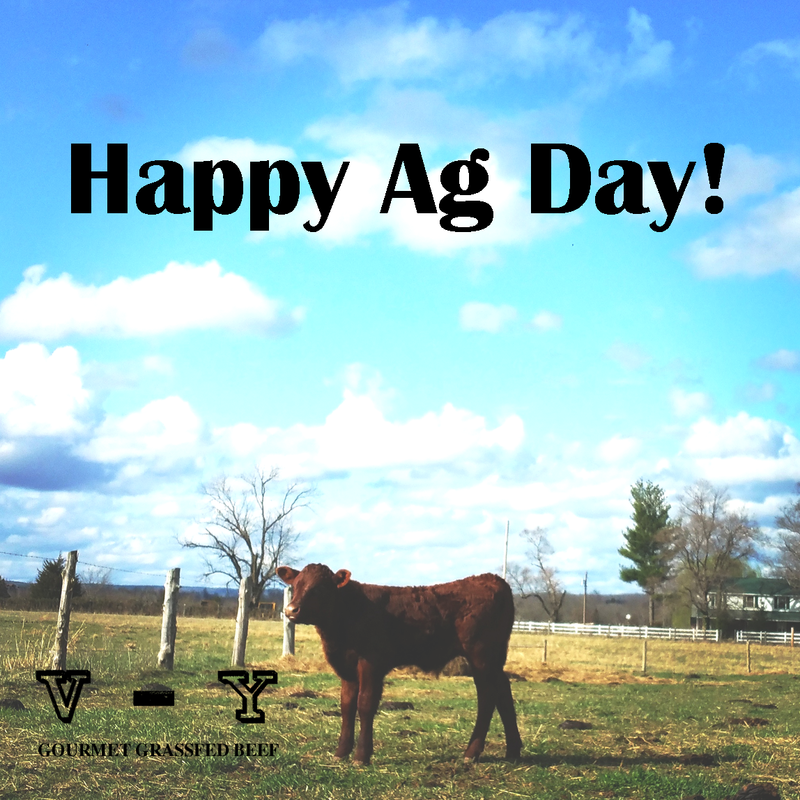 Apparently this year's National Ag day theme (Yes. It has themes. Who knew, right?) is "Agriculture: Stewards of a Healthy Planet." Fitting. That pretty much sums up why Captain America and I are raising our cows the way that we are. Would it be cheaper to fatten them up on grain? Yes. It takes a lot more grass to add a pound of weight than it does corn, soy, or industrial food byproduct. In fact, grass fed beef cattle frequently take longer to mature for this reason. Would it be easier to dose with preventative medicine? Yes. Feeding them a few rounds of antibiotics to prevent infection (or just promote weight gain, because that is a common use of subtherapuetic doses of some antibiotics - usually penicillins and tetracyclines) in with their feed ration, also known as medicated grain, would be much easier than monitoring them and then separating and working the sick animals to provide them with individualized veterinary care based on what illness they have. No one who hasn't worked cows in a head catch without a squeeze chute can truly appreciate just how much anger a 1,500 lb animal can manifest. Watch your arms folks. They can snap them easily while you're giving injections. Sometimes I think rodeo cowboys have nothing on farmer's reflexes. Would it be better to do that? For us personally the answer is no. There is a place in the world for that model - I'm not throwing any shade on the family farms that have to do things that way to stay afloat here. But for Captain America and I the choice is simple. Before he and I even met I started asking myself the tough questions. How do I do my part to help prevent super bugs, or keep bee colonies alive? How do I reduce my carbon footprint? Is row cropping really the only profitable way to farm the land I have? Could there be another way to be able to afford my property taxes? Is all that round up runoff really safe? How would I have to care for an animal to not feel guilty about eating it if I were to be haunted by its ghost? How do I take the best care of the land that I have? For me, and for us, the decision to create 200 acres of rolling pastures out of some pretty severely ditched up farm fields in order to support a thriving herd of grassfed cows was the perfect solution. By planting a mixture of endophyte free fescue, orchard grass, and red clover all over the hillsides not only will the cows have good forage; but we will stop sending so much topsoil down to Louisiana every time it rains. Plus, we won't have to worry about spraying it with pesticides and herbicides that could wind up in the waterways along with the soil. Unless we get a creeping buttercup infestation. Then they shall be purified with fire, 2,4-D, the wrath of God, whatever it takes to get rid of those toxic little suckers. Damn buttercups... not even goats can eat creeping buttercups. Ugh. Anyway, the clover will also feed bees, which will help out the local colonies and maybe even pave the way for a hive or two of our own one day. Isolating our herd on our acreage and using rotational grazing not only is better for the grass it helps to reduce exposure to some pathogens and will help keep the cows healthier, so even if we do get a bug coming through it should be easier to monitor and treat. Basically what all of those decisions boil down to is CA and I doing our part to live this year's Ag Day theme: "Agriculture: Stewards of a Healthy Planet." every day. I encourage you to go out and think about how you could improve your stewardship. After all, just a pot full of flowers could help a bee or butterfly, and just buying from a local producer could help a small farmer pay their property taxes and keep working to be a better steward himself or herself. Healthy planets are better with healthy grass, which grows some pretty healthy cows! Make sure to follow farmingfoible on Instagram to see more of our daily adventures.